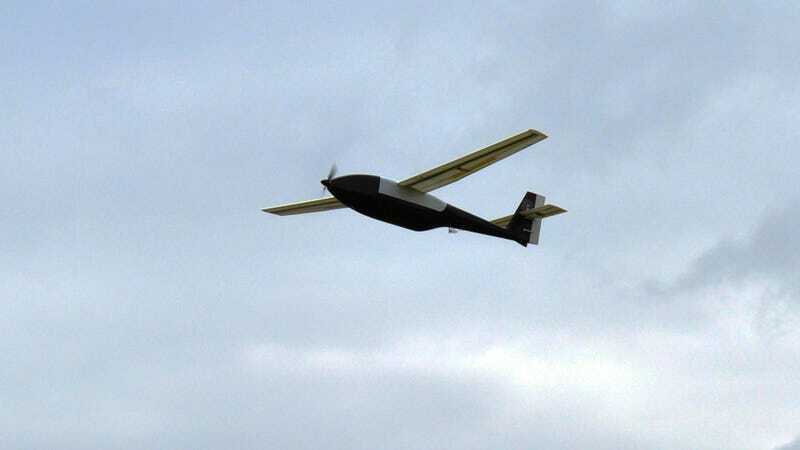 In 2009, the Office of Naval Research's super-endurance drone, the Ion Tiger, flew for a record 23 hours, 17 minutes—the longest ever for a fuel cell-powered UAV. But late last week, the ONR demolished its own record with a 48-plus hour foray into the great blue yonder. The original Ion Tiger relied on hydrogen compressed to 5,000 psi to power its all-electrical system on its record-setting flight—fantastic by fuel cell standards, but not that far off from other US UAVs that run on fossil fuels. However, by replacing the compressed hydrogen with a cryogenic fuel tank filled with liquid hydrogen—which boasts triple the energy density of compressed and 21 times the density of equivalent-weight batteries—the Tiger's 550-Watt engine can keep the 37-pound drone and its 6-pound payload aloft up to 14,000 feet for twice that duration. What's more, these electric engines are nearly silent, allowing the UAV to swoop as low as 1,000 feet without being audibly detected; it also leaves no con trail, and has a much smaller thermal signature than internal combustion engines.